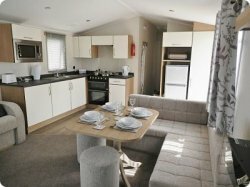 Willerby Season 3 Bedroom Caravan with fully double glazed windows and central heating in all the rooms located in a quiet corner in bay view that is a sun trap all day when the sun is out it only takes 3 minutes to walk to the beach and play area and the funfair and about 5 minutes to walk to main complex. The main lounge has 2 L shape seating areas 1 with a pull out bed and the other has the table and 2 stools for the dinner area plus a 32 in TV and DVD combined. Kitchen has Gas Cooker, Fridge Freezer, Microwave, Electric Kettle and Toaster. Cutlery, pots and pans etc are also included. Master bedroom with double bed, wardrobe and mirror. Twin bedroom has 2 singles beds, wardrobe and mirror. 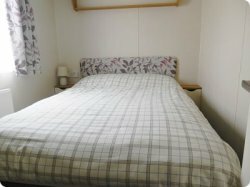 Second Twin bedroom has also 2 single beds, wardrobe and mirror. 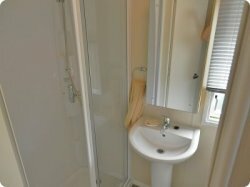 2 toilets 1 with a shower, wash hand basin and WC and mirror and the other has a WC, wash hand basin and mirror in it. 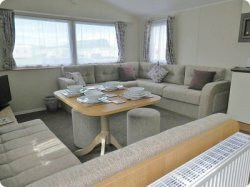 This is actual photos of the caravan and is not catalogue photos. Location: Beach is a 3 minute walk. 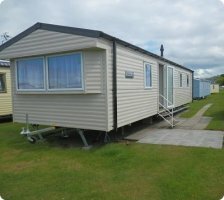 5 Minute walk to Craig Tara complex, restaurant etc.